Experience the power of spoken word! Poets bring their words to the streets and pavements of our beautiful Auckland City, bringing people together and igniting essential conversations. This trans-cultural, site-specific experience will provide a conduit to bring the joy of poetry as a ‘performance art’ to the Central City community – live spoken word performances that will inspire, comfort, educate and celebrate people of all ages and cultural backgrounds. Each of live spoken word “pop up events” will feature a well established and young up-and-coming poet/spoken word artist – providing work for artists as well as an opportunity for the high quality artistic expression. The project will give established and up-and-coming writers/performers the chance to engage with the community and to share their knowledge and experience. At the same time events will provide an accessible local opportunity for the audience to experience and engage with art in busiest locations in Auckland CDB. Join us at Britomart 3pm and follow the action as it unfolds. Delivered to you by Printable Reality and Splice2014. – generating interest and intrigue in the Auckland City Centre. For this pilot programme, we will facilitate two workshops on Saturday 2nd August, for selected performance poets; developing individuals skills that will provide them with necessary tolls-set to deliver poetry in an contemporary, interactive way. To be followed by live “Pop-up street performances” in Auckland Central on 3rd August and with an idea of enabling poets to continue this kind of engagement into spring/summer 2015. + Invitation for a ‘City Givers’ dinner and an evening performance opportunity on Saturday, as well. Please email your poetic CV and a short cover letter to gus@printablereality.com , telling us WHY you would be an ideal candidate for this project. Applications close on Monday 28th July, 5pm. 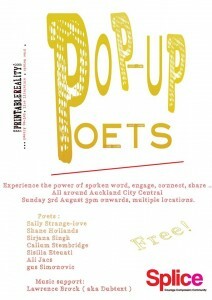 For more info about POP-UP POETS please contact Gus.